them, it is also an additional ornament to dress up your home! The hat is constructed of red velvet and white sherpa for that classic Santa look. Inside the hat is a nice, cushy bottom also made of sherpa just right for settling down on a cold December eve. 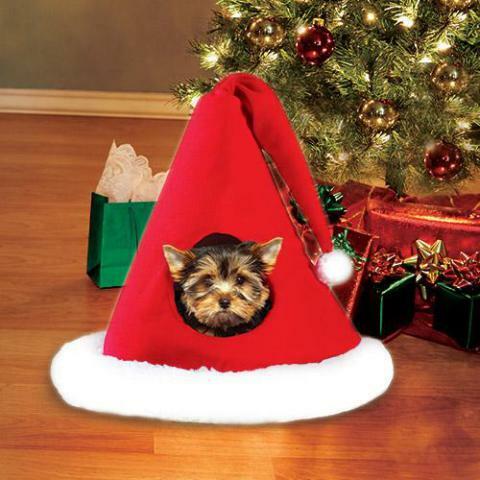 Being enclosed allows your pet's own body heat to help warm it up and make it extra snugly. For cats it doubles as a great place to hide for attacking your ankles when you walk by. The hat collapses for easy storage until next Christmas. It measures 30" tall and 17" in diameter. Suitable for most cats and small dogs. 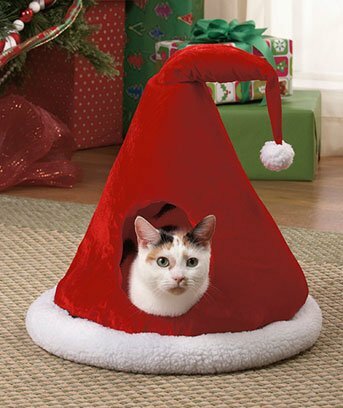 To order your pet a Santa's Hat Pet Cave, click here.